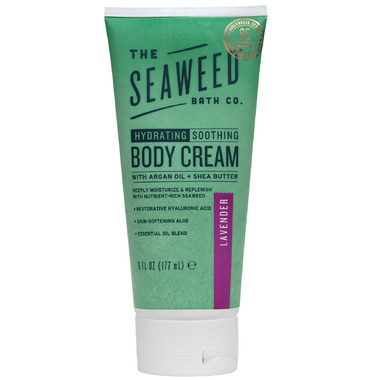 Wildly Natural Seaweed Body Cream combines the nourishing properties of seaweed with a variety of natural ingredients, including Shea Butter, Kukui Oil and Argan Oil, to soften and moisturize dry skin. About Kukui Oil: Brought to Hawaii by early Polynesian settlers, the Kukui Nut Tree is so embedded in Hawaiian culture that it is the state tree of Hawaii. Pure Kukui Oil, rich in oleic, linoleic and linolenic acids, is a potent natural moisturizer that helps soothe dry, flaking and scaling skin. About Argan Oil: Argan Oil is revered worldwide for its moisturizing and soothing properties. Rich in vitamin E and essential fatty acids, Argan Oil naturally comforts and nourishes your skin. Ingredients: Aqua (Water) with Fucus Vesiculosus (Bladderwrack Seaweed) Extract, Caprylic/Capric Triglyceride, Carthamus Tinctorius (Safflower) Seed Oil, Vegetable Glycerin, Stearic Acid, Butyrospermum Parkii (Unrefined Shea) Butter, Argania Spinosa (Argan) Oil, Aloe Barbadensis (Aloe) Leaf Juice, Aleurites Moluccana (Kukui) Oil, MSM (Methyl Sulfonyl Methane), Stearyl Alcohol, Hyaluronic Acid, Glyceryl Stearate, Theobroma Cacao (Cocoa) Seed Butter, Polysorbate-80, Tocopherol (Natural Vitamin E), Phenethyl Alcohol, Panthenol, Xanthan Gum, Allantoin, Lavandula Officinalis (Lavender) Essential Oil. This Product is Recommended for: Everyone, especially sufferers of dry skin, red skin, scaling skin, flaking skin, and/or rough patches. The cream itself is great, relatively thick and does the job well - I'd definitely recommend it for dry/winter skin. I do wish the bottle was a bit bigger, it's quite small and I'd rather pay a bit more and have to order less often.